Deep golden colour, creamy white head and nice noble hop aroma. Nice malt backbone with some caramel sweetness, finishing dry with a firm hop flavour and bitterness.. Unfortunately most people in Britain think that Lager is cheap, fizzy, yellow beer that doesn’t taste of anything. This stereotype has been perpetuated by a certain regional brewer that still likes to make fun of the drinkers of this type of beer. 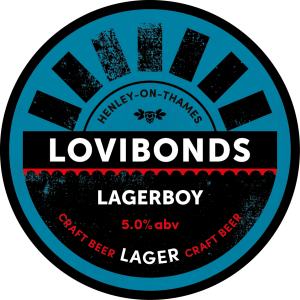 Lagerboy is our proof to you that a Lager brewed with care and attention can be just as flavourful and moorish as the best British of Real Ales. We craft this beer with British and German malt, an obscene amount of Czech hops and then ferment it low and slow with one of the most famous lager yeast strains. If you didn’t know, it is ONLY the type of yeast that determines if a beer is a Lager or not. Deep golden colour, creamy white head and nice noble hop aroma. Nice malt backbone with some caramel sweetness, finishing dry with a firm hop flavour and bitterness. Pretty versatile…can stand up to big backyard burgers, wings and pizzas. Also won’t over power delicate shellfish, chicken or salad.